IN 1948, a rather wise man who’d been down and out in Paris and London and fought in the Spanish Civil war penned a rather dystopian view of the future – this seminal work known simply as “1984”. His vision of 1984 was not a pleasant one. A world controlled by a totalitarian police state, where the infiltration of the state into private life was complete to the point of mastery of thought – and the ultimate crime was thoughtcrime. The similarities between the world Orwell predicted and the government powers enlisted in the wake of 9/11 and such events have been written ad nauseum and conveniently ignored by most people (perhaps the journalists have been vapourised). More recently, the complete intrusion of freedom of thought has been shown by companies like the great Bookface selling all the information they can about you – e-profiling – has shown that even our thoughts are really not that impregnable. However, as this blog is completely and utterly apolitical (VOTE MIRABELLA OR SHE’LL TAKE AWAY YOUR HOSPITAL FUNDING) and ostensibly about bicycles, I’ll focus on a different area. Orwell’s totalitarian state functioned around the notion of doublethink. Doublethink pervaded the world of 1984. The ability to accept something that was logically impossible if told to do so, and to adapt logic to create a supporting argument to suit the task. Freedom, Orwell’s Winston wrote, is the ability to say that 2+2=4. Later, under extreme duress, Winston is persuaded that 2+2 can indeed equal 5. Travel: Spending 15 hours in a car to do a 5 hour bike race is demonstrably a great use of a weekend. Yet, travel we did – a long slog up the highway through misting winter rain, then plunging up the Hunter Valley and over the range to Tamworth. 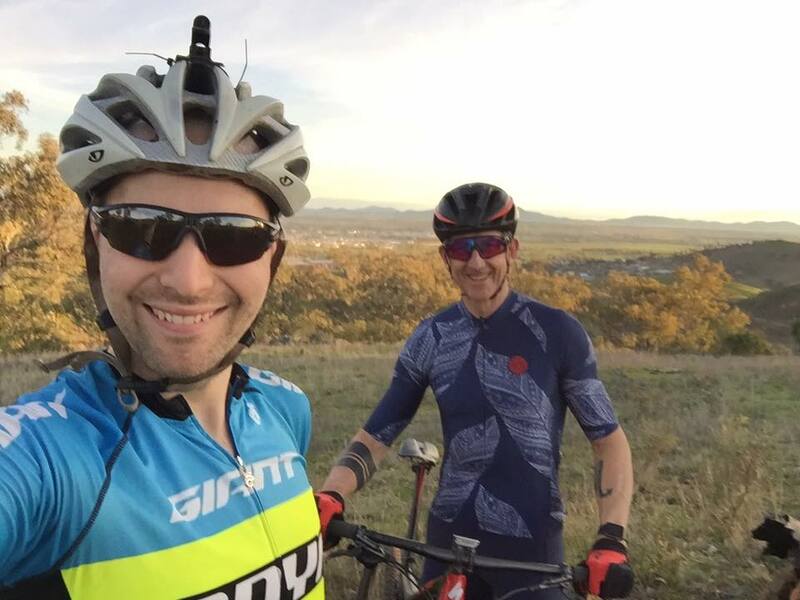 Our patience was rewarded – warm, dry trails set on the native hillside above Tamworth. With challenging rock garden sections, slaloms of sublime flow, and tight and twisting, there was no doublethink required to enjoy Tamworth. Self-seeded start lines are always the ultimate exercise in doublethink. When races like Capital Punishment used self-seeded group starts, the ultimate in doublethink was evident – with something like 80% of the field predicting it would finish in the top 10% of the race. Mid-pack racers with grand aspirations file in front row and centre, elbows out, or park in front of faster racers. Of course, the chaos that often results from this is spectacular – with grand hooks and swerves thrown, before imminent implosion on the first hill. This is the truest art of modern doublethink – the ability to understand what is involved in a race, yet simultaneously place oneself in aspirations of a position that can never realistically be maintained. Tamworth, however, was refreshingly free of such action – with a small but very speedy field. World 24hr champ Liz Smith headed up a women’s field replete with junior national champions, Cam Ivory lined up – missing out on Rio for the grander scale of Evocities – alongside Jason English, Drapac rider Sam Spokes, Andrew Lloyd, Stefan Merriman and myself – a nice little gaggle of trouble for a race, and with rather a few titles in various disciplines between them. With the impending firing of the gun, blowing of the whistle, tooting of the horn, or other mechanism to set free the imaginary leash of frothing rabid mountain bikers, the start happens. Amidst a flurry of lycra-clad limbs and a concerning crunching of drivetrain components, forward momentum somehow eventuates and the field streams out onto the course. Almost invariably, the start is conducted at hectic, unsustainable pace. A sublime act in doublethink, somehow convincing oneself that break-neck sprinting is the appropriate starting strategy for a sustained effort. Scrambling up a loose fire-road, it was a matter of maintaining the best position possible while avoiding spontaneous combustion. It is, however, all about position. Positioning into the singletrack is critical for getting out into clean space, and onto clean trails. 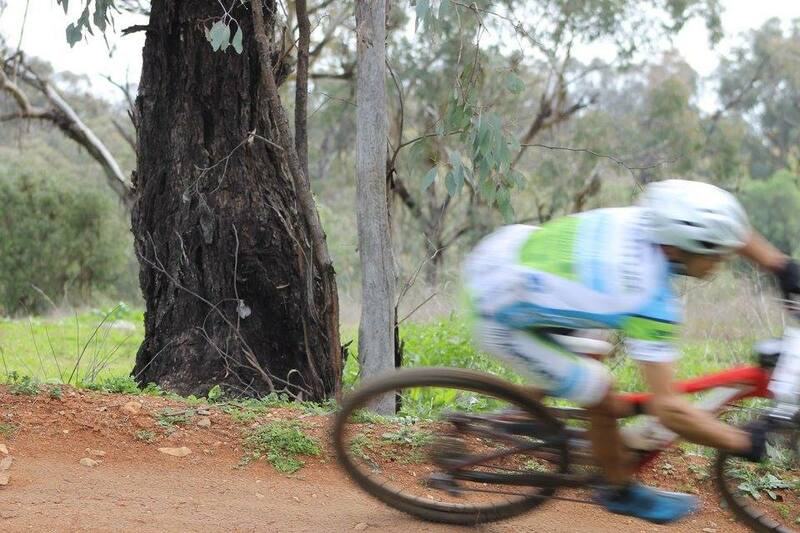 Slotting into the singletrack in a good position and on a speedy wheel, the start was going well. Bombing down the first rock garden, I got a little loose and reckless. A dropped chain eventuated. Scandalously, much like the experience of Andy Schleck in the Pyrenees in 2010, no-one waited for my dropped chain, as I fumbled in an uncoordinated panic to perform a basic mechanical task. Jumping back on, a decent gap had soon formed to the front runners. One would think that after years of racing, I might have acquired sufficient experience to know how to handle a minor set-back with maturity and foresight. Instead, I engaged in some hefty doublethink of my own. I justified high pacing on the climb on the theory that, as long as I wasn’t pulling a gratuitous pain-face, I couldn’t possibly be going too hard. I justified poor lines on the rocky descent on the basis that I’d have to push hard to close the gaps. This doublethink soon extended to other factors of the race. Despite sweating hard in the warm Tamworth sun, I was persisting with a limited hydration strategy of a bottle every two laps, justifying a lack of bloating as an improvement from lower fluid intake. And so, the race chugged along fairly well. 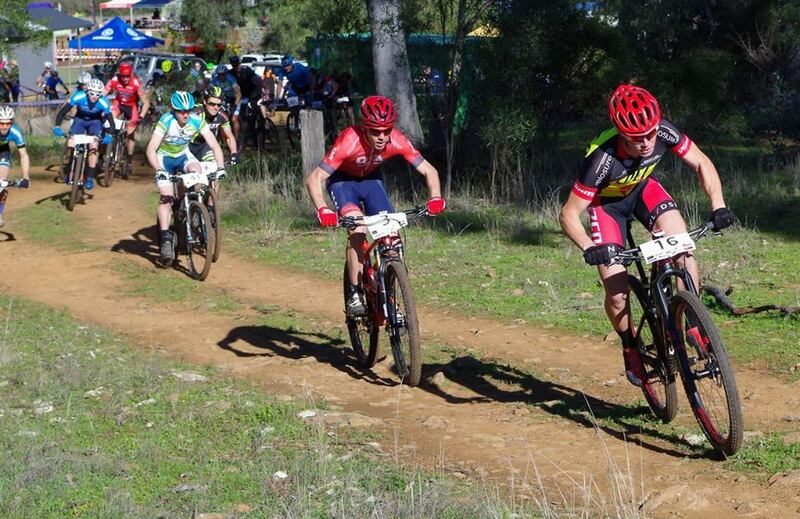 Slowly grinding my way back into the top three with Cam and Jason vanishing into the distance and Lloydy and Stefan lurking ominously behind, the race was progressing nicely. The Anthem was rabidly devouring the rock gardens of the track and plodding efficiently away up the steep climbs, the legs were spinning along nicely, and so far, I hadn’t splayed myself over the rocky descents. Something unexpected soon happened – I started closing in on Jason. For all my lack of foresight, this time, I slowed to think rationally about it, and soon reasoned that he must have had a mechanical incident. While my doublethink-voice was saying that the best possible strategy was to invoke complete annihilation and launch a crippling attack that could only be maintained for 2 minutes – and somehow miraculously maintain it for another two hours – delusions of grandeur were soon put aside by the onsets of a few cramps. It would seem completely implausible for dehydration and cramping to result in the middle of August in inland Australia, but with a warm sunny day and a climbing-heavy course, riders were soon stained with white bands of salt on jerseys. It is a fact universally recognised that Canberra in winter is basically the frozen wasteland north of the wall. Doing the vast majority of my regular riding around dawn or well after sunset, I’m acclimatised to riding in very cold conditions. 18 degrees and sunny therefore presents itself as rather a rude shock. In the midst of some on-setting cramps on the climbs, delusions of grandeur were rapidly shelved and I focused on nutrition and hydration to make for a sustainable remainder of the race – effectively, damage control. It’s moments like these where I call on a hefty dose of doublethink to find the fun in the midst of suffering. Athletic exertion is inherently defined by a delicate balance between pleasure and pain – between smiling and suffering. Maintaining Type 1 fun is all-important, however. With trails like Tamworth, sometimes all it takes is a step back from racer-boy mentality into hairy-legged-hubbard mentality. Enjoying the flow of the trails, or the moment of adrenaline dropping into a steep rocky chute. Immersing in the flow of the berm next to a gurgling gorge of a creek. Somehow masking out the pain from the mind and riding on the happy thoughts. But it was alright, everything was alright, the struggle was finished. He had won the victory over himself. Maxxis for the awesome Ardent Race tyres – held up beautifully in the rocks! 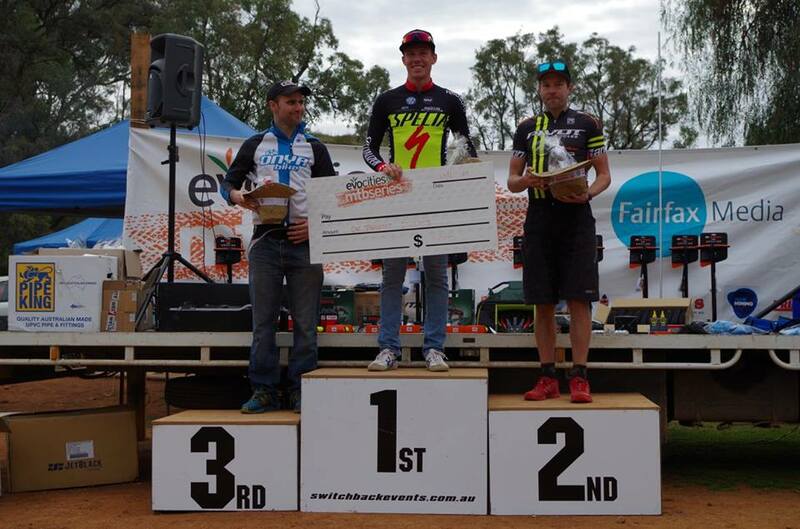 This entry was posted in Races, Uncategorized and tagged endurance, evocities, MTB, race, solo, tamworth. Bookmark the permalink. Really great write up Ed, and nice racing result! Cannot believe no one waited after your dropped chain. And now I’m doublethinking, as I do every winter, I should’ve kept riding through the freezing! We still have a solid 2.5 weeks of August to bask in the frosty glory!